Facebook made all videos default to soundon, leading many to preemptively mute theircomputers or tabs while browsing. Instagram video ads are just as popular asFacebook video ads, if not more so! And new formats like in-stream video ads, Instagram Stories and Facebook Live have taken over. And, of course, the world of video adshas gotten more competitive than ever! With all of these changes, what are thetop tricks now for making sure your video ads remain extraordinary? We’ve outlined five Instagram andFacebook video ad examples for you below. Obviously , people’s attention spans areshort. Some say they’ve shrunk to 8 seconds; others think we have become more spacey than goldfish. Although the current format for Facebookand Instagram video ads is 60 seconds, for a lot of people that’s still too long. According to Wistia, people stop watching onlinevideos just seconds in. 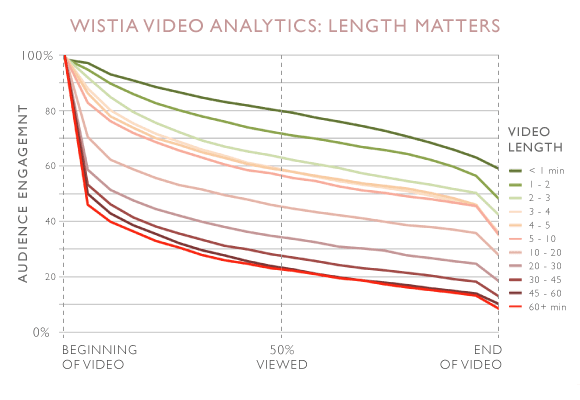 Longer videos lose people faster, but no video isimmune. A large portion of peopleise generally going to stop watching yourvideo halfway-through or even less. No matter how high quality your content might be, people aregoing to drop like flies when they start watching your video ads. So how do you get your message across intime? First, put the good stuff into the first5-10 seconds. As the chart above highlights,viewership begins dropping with each additional second that passes after this.Whatever you want the maximum number of viewers to see should go into the verybeginning of your video. Then, make sure the entire video remainsspecific — that each shot is meaningful. You can’tafford to waste a single frame. You can see both of these lessons in this videoad from Velocity Black, advertising its new members app. It’s something that hangs heavy over yourhead. You’ve got a great reach on Facebook.You’ve done well to build an audience and get them to engage with your content.It is so satisfying to see this happening, so what could possibly be botheringyou? Advertisers and marketers are beginningto realize that a higher engagement rate and reach doesn’t always translate tothe kind of ROI that a brand or business looks for in theiradvertising/marketing campaigns. Many companies have even pulled out ofFacebook due to poor sales and conversions. Your business goal that drives yourFacebook marketing strategy should be to increase conversions. However, thisgoal has become difficult to achieve with increasing consumer expectations andrising competition for News Feed real estate. That said, you’ve also been blessed withoptions such as Facebookvideo ads. These ads, when executed correctly, can lead to asignificant increase in conversions. Videos play in News Feeds automatically, and are counted as aview after 3 seconds (the industry standard). People seeing the video can clicka button to unmute a sound, and see the video in full screen by expanding theplayer. This feature is applicable to Premium Video Ads only (videos that are 15 seconds long). All videos show how many views they have received, which can beused to calculate the conversion rate and aid content discovery. This graph in Page Insights willshow the level of user interest in different parts of a video. A spike in theviews at certain points will indicate interest at particular moments, whereas adecline will showcase the part of the video where people stopped watching. Don’t just run Facebook video ads for thesake of pushing video content out there. Create inspirational and informativecontent to influence the decision making process of the audience and get them totake action. Such videos communicate your brand or product’s story in a better waythan a sales video would. The script should distinguish the benefits of doingbusiness with you and how your company is better than your competitors. It’simportant to stay tasteful and not get salesly from start till finish (let thecall to action do the sales part). 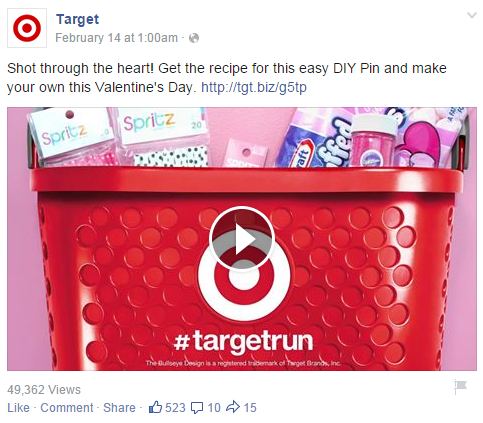 Target dida great job by sharing this inspirational DIY video on Valentine’s Day, whichalso helped in increasing the retailer’s own sales. A study by Anagard informed that when it comes to attention on theweb, it’s a case of blink and miss. So people normally see a certain content onFacebook for 6 seconds or less (just somewhat longer than the average link). Soif people don’t notice, your content can’t convert, so whatever makes them looklonger will help with conversions. That’s what educational and inspirationalvideos do. Use quality best practices while creating such videos. 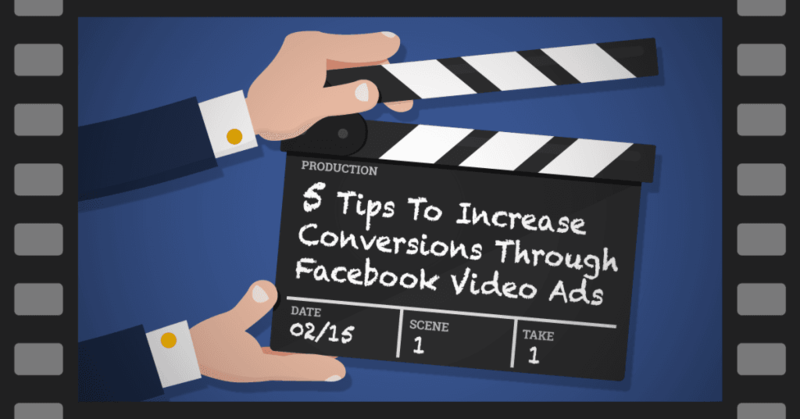 Facebook video ads will lead to moreconversions when they include a call-to-action (CTA). The CTA will tell people what to do, such as ‘watchfuture videos to learn more’ or ‘stop by our store to buy these items’. The CTAcan also direct viewers to discounts or coupons. Advertisers also have theoption to redirect users to a dedicated landing page for relevant actions inthe video (this works well for eCommerce stores). Here’s a call to action button at the endof the video for Felicia Mupo. It redirects to the official website. Don’t take a vague approach and hopeyou’ll be able to convince people to take certain action. That won’t happen ifyou overwhelm them, even if the video itself is creative. Make a shortlist ofwhat you aim to accomplish, then cut it down to a narrowed list. Then use thatlist to select what you want the audience to do and use it as a CTA. Don’t link CPC ads to external videos asthere will be no auto-play in this case. Use oCPM bidding for video ads as itwill optimize the video ad towards people who are more likely to take thedesired action (such as go to the website at the end of the video) rather thanjust engaging with the post. This will reduce your cost per video view and showbetter insights for the ad. You pay per view with oCPM, whileenabling Facebook to search for viewers within your specified price point.While the price is going to be higher than normal CPM bidding, the cost perview will turn out to be lower at the end. You can learn more about these bidtypes in our Facebook ad bidding guide forbeginners. Standard video ads on Facebook can becreated for specific people, such as those who have already viewed yourcontent. For example, you can come up with a follow up video for alreadycaptured leads to help them transition from awareness to consideration andaffinity. Most of the targeting options can be found under the ‘behaviorheading’ for video ads. There is also the option of usingthe Custom Audience feature while creating Facebook ads. This will target the videosto your existing audiences, after you upload their user IDs, mobile IDs,numbers, and/or email addresses. This will enable you to reach audienceswho already know about you and inspire them to take action through the video.The feature will be quite useful to recover lost customers or encourage thosecustomers who don’t open your emails. And for reaching new customers, you can‘exclude’ the entire custom audience set while setting the target for a videoad. Test different video ads to determine what converts best. To optimize the video adcampaign, test more than two ad sets; because the first video ad outperformsthe second doesn’t mean it will do better than the third video ad too. A/B test everything from the content inyour video to the videos’ headline and call-to-action. Determine what worksbest. You can also use the audience retention graph in this case to see wherethe interest was lost, and then A/B test 2-3 videos to see what works best torecapture interest. Lastly, A/B test your target audience todetermine the best viewers who’re likely to convert. Videos are likely to get greaterengagement on Facebook because of their visual power. And by following theabove-mentioned strategies, you can ensure that you get conversions from thatengagement. Do you use Facebook video ads? What doyou think of the results? Feel free to share your thoughts and suggestions incomments. Velocity Black immediately hooks you — inthis case, transporting the viewer to “the edge of space.” The visuals arestunning; the mood is epic. In case you’re tempted to scroll past, Velocityrapidly shifts to its next adventure scene, swimming with orcas in Norway,followed by a heli ski trip over volcanoes. The scenes absorb the viewer inadventure before you’re able to look away. The entire clip clocks in at just aboutfive seconds. If you notice it in your Instagram feed, you’re likely to stopand watch the whole thing. They knew it would be tough to keep yourattention—and they decided to work with that, by making it almost impossible tostop watching. When you tap a video on Facebook orInstagram, it will now automatically play with sound. It was a controversialchoice, and one that has many users scrolling their feeds with their phones orcomputers on mute. While you always had to think about howyour videos worked without audio, that is especially pertinent today. Today,nearly 85 percent of video views happen in silent mode. For advertisers, without the automaticopportunity to cue a friendly voice or striking tune, how do you get viewersto want to turn your sound on? Or, alternatively, how do youcreate silent clips that still stick? First, try catchy colors. Red, for example, is proven to strike a particular chord, along with other primarycolors, like blue and yellow. MailChimp is great at this, oftenbuilding entire shots from these bold hues. The visceral colors keep us engaged above video’s narrative, piquing curiosity as to what story MailChimp is telling. Another way to get your message acrosswithout sound is to employ text in bold, dynamic forms. The recent ad for the movie, I,Tonya, does this with flair. The white, bold words from the AM New York reviewstand out in stark contrast with the black background. Their alternating sizeshelp draw the eye down the text in dramatic fashion. Paired with actress MargotRobbie’s frightening, determined gaze; the viewer can’t help but internalizethe intensity she brings to the film, and the urgency with which it demandsyour attention. The point is this: instead of being anobstacle, sound-off videos can play to your advantage. Bold colorsand dynamic text can capture people’s attention in the first few seconds — andspur them to turn up the volume later on. A bit of design goes a very long way whenit comes to Facebook and Instagram video ads. You don’t need a professional videostudio to produce a commercial that looks professional with the various simple video editing tools out there. And adding even basic effects is one of thebest ways to increase the conversions and engagement on the videos that youmake. But as this GIF suggests, the video just does not end. The coffee goes on for quite some time,the slow motion bringing the whole video to a new level of luxury anddecadence. With the pro-looking title slide —which reads “Slow MovingMonday”—the whole thing looks more like an amateur short film than a simplecoffee shot. Natural lighting and a tilted lens keepit hypnotic and enticing. Another, shorter work from Bakedincorporates a unique viewing angle, some geometrical shapes, and anotherwell-timed title slide. Before Baked got in touch with FacebookCreative Studio and started making videos like this, they were uploading thesame shots of coffee and pastries over and over again. After the video above,they saw a 40% increase in Thanksgiving pie purchases—proving to everyone thatputting a little bit of extra effort into the design of your video can have abig impact and drive a big return. Using DIY design techniques can help younaturally integrate into your viewer’s stream, keeping it in line with much ofthe content they experience every day, make your brand feel more friendly andaccessible—and get you more customers. 4. Pair your Instagram or Facebook adcampaign with a specific product launch. Using video ads in unique ways can be agreat method for catching viewers’ attention ahead of a new product launch. Wistia’s decision to use @jeffvincent ina penguin suit helps build the mystery behind what’s “coming to [viewers]tomorrow.” Those who follow Wistia on Instagram feel “in” on this companysecret. Releasing teasers like Wistia’s is agreat way to make your social media followers feel like they are a part ofsomething exclusive, which can help build customer loyalty. Building an air of mystery, hype, and/orprivilege around a new product or service with creative video ads can beinstrumental in elevating sales on the launch. Finally, with all of the new options forcreating Facebook and Instagram video ads, split testingremainsas essential as ever. · Wait a few days beforeevaluating your results. · Wait to confirm your resultsuntil you have at least 95% statistical significance. · Stick to testing one variableat a time. We break down each of these below. Wait a few days beforeevaluating results. recommends waitingbetween 3 and 14 days to both capture sufficient data and stay within theconstraints of your budget. Of course, this depends on the audienceyou’re testing. For example, if you’re running a test for site traffic, and yousense that people generally visit your page on the weekends, you’d likely wantto cover a full seven-day period. Overall, less than three days couldresult in a sample of results that are too few and/or scattered to really meananything on a larger scale. More than 14 days could result in a lower ROI sincemost A/B split test winners can be determined before this two-week period isup. Wait to confirm yourresults until you have at least 95% statistical significance. In addition, while one test may yield ahigher conversion rate than another, it’s important to confirm that thisimprovement is significant (i.e. not up to random chance). Using an A/B significant test, like Kissmetrics‘ can be valuable to verifyyour findings. Here, users begin by inputting their overall page visits, alongwith conversions. In addition to delivering conversionrates for each test to its users, Kissmetrics determines the certainty withwhich one version of the advertisement is more successful than the other. Here, Kissmetrics is 99% certain thatvariation “B” will convert users at a higher rate than variation “A”.Kissmetrics deems any certainty rate below 95% not to be significant (i.e.users should not move forward with the campaign). Using an A/B significance test can helpboost confidence in a new campaign and avoid costly errors by using the wrongvideo ad variation. Stick to testing onevariable at a time. While you might be tempted to test a tonof ideas at once (e.g. different video titles or color schemes), it’s importantto focus in on one factor for each test. For example, if your current audience ismen in their twenties and thirties on the East coast of the United States, butyou’d like to see if the same demographic will engage with your content on theWest coast — test the new location but keep the gender and age range constant. While multivariate tests do exist, they are more complicated and come at a higher price. Thevalue of single factor A/B tests is understanding exactly what variable you cancredit for your results prior to moving forward. Embrace restrictions on length and soundto create Facebook and Instagram video ads that are short, to-the-point,vibrant, and relatable. Don’t be afraid to bring in DIY methods like iPhonecameras to give your followers a window into what goes on in your day-to-day —and even household items like plants to make them feel more at home. If you’re used to publishinghigh-resolution, professional clips, consider mixing it up with raw footage,especially when building anticipation and a sense of things coming together,leading up to a new product rollout. Keep paying attention to the results ofyour tests, continue to improve your variables, and up your conversion rates inno time. And now, if you want to dive into thepast, keep on reading our 2015 post (the tips still matters) then leave yourcomments!